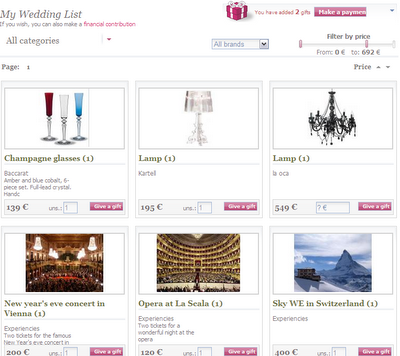 European wedding site Zankyou provides a variety of services for soon-to-be married couples and their guests. Zankyou enables couples to create private, personal wedding websites that not only keep guests informed about the ceremony but also solicit their input in a fun, non-obligitory way. The wedding pages go beyond providing ceremony information and directions-leaving room for nearby activities, recommended hotels, etc. They even programmed the site in five languages (English, Spanish, Italian, French and German) to make things easier for international guests. Zankyou not only makes wedding websites more fun for guests, but also provides additional benefits to the bride and groom. Couples can use Zankyou to poll guests. They can also encourage guests to share photos, videos, and add songs to the wedding playlist. The site also offers wedding planning content in their "Zk Magazine" section, with suggestions for dress, themes, favors, and celebrity wedding gossip. The best feature on Zankyou is the wedding list feature. On the site, couples can create wedding registry items not only for kitchenware and furniture, but also parts of their honeymoon, gifts to charity, etc. Zankyou does not purchase these items but puts the funds directly into the couples' bank account, allowing them to decide what they will ultimately use the money for. It allows users to get creative with their registry and provides couples with the freedom to decide what kind of presents they want. Zankyou is a great alternative for couples who may not necessarily want or need items from a department store, but feel awkward asking for checks or putting bank account information on their invitation.